Tagline: Kill or be replaced. Box Office: Budget $30 million. Opening weekend $8.046 million on 1936 screens. Domestic gross $18.967 million. MPAA: Rated R for strong violence and for language. The Nineties marked the growing influence of Hong Kong cinema in Hollywood. A decade ago, folks like John Woo and Jackie Chan were essentially unknown to most people in the US; they boasted a good cult audiences but hadn’t even remotely entered the mass consciousness. However, things changed radically over that time. Now we’re almost at the point where the Hong Kong style has become oversaturated. Every movie that wants to seem “hip” goes for that HK vibe; witness the disaster that was 2001’s The Musketeer, a flick that mindlessly used martial arts styles for no reason other than add that fashionable element. Still, most of the movement has been positive, as the increasing popularity of Asian cinema helps make Hollywood more diverse. Woo and Chan have become major players, and the success of 2000’s Crouching Tiger, Hidden Dragon shows that audiences can accept subtitled action flicks. Not all of the big figures from Hong Kong have made the transition, though not for a lack of trying. Chow Yun-Fat, one of Woo’s favorite actors, made a nice impression in Tiger, but he hasn’t experienced similar success in his English-language affairs. 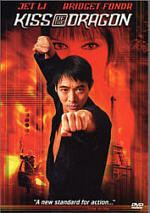 As of February 2002, Chow’s appeared in three English flicks, but none of them have made an impression with the American public. Probably the biggest disappointment was the big-budget Jodie Foster vehicle Anna and the King. While not a bad little flick, it failed to become a hit. 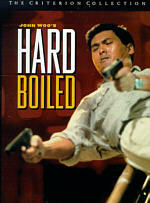 The film was a stretch for Chow’s public image, as he departed from the standard action milieu and went for a romantic drama. For his initial foray into the world of American movies, Chow took the more tried and true path. Unfortunately for him, 1998’s The Replacement Killers did little to establish him as a star, and for good reason: it’s a pretty bland film. Though almost a carbon copy of some of his Hong Kong fare, Killers fails to capture any magic. 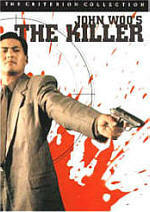 At the start of Killers, we meet John Lee (Chow), a hired assassin who deftly takes out a target. For personal reasons, he owes a debt to crime boss Wei (Kenneth Tsang) and has to complete one more job before the bill is paid. However, for reasons we learn later, Lee literally refuses to pull the trigger and he skips this assignment. One can’t simply say “no” to someone like Mr. Wei, so Lee quickly tries to skip town. He needs a fake passport, so he gets referred to Meg Coburn (Mira Sorvino), forger extraordinaire. All seems to go well until Wei’s forces locate the pair and go in for the kill. Of course, they fail on their initial attempts; if they didn’t, Killers would end pretty quickly. The rest of the film follows the attempts of Lee and Meg to escape their clutches and also to halt the murder that Lee avoided; hence, they need to derail the titular replacement killers and also finally take care of Wei. At its heart, Killers features a pretty compelling story. It’s an intriguing notion to consider an assassin pursued by assassins; while not tremendously original, it still has some strengths that could have allowed the film to flourish. Unfortunately, Killers offers a serious example of style over substance. Led by first-time feature director Antoine Fuqua, his roots as the creator of music videos and commercials seem glaringly obvious. The entire movie seems excessively stylized and flashy as it favors looks over brains. Of course, I’m not opposed to slick visuals; hey, I’ve liked two of Michael Bay’s four films, so I can’t complain about the emphasis on style. However, say what you will about Bay, but at least he usually lends solid thrills and excitement to his flicks. Fuqua lacks the substance to make the movie work even on a superficial level. To be sure, the movie looks good, but virtually all of the flash shows no purpose. The action sequences fail to provide an impact because they’re so artificially stylish and glossy. Frankly, the action seems gratuitous and pointless for the most part, and it helps accentuate the flat and generic nature of the characters. The Replacement Killers has more than a few solid performers, but they never get much to do here other than shoot and dive. To be frank, Killers isn’t a terrible movie, but it feels surprisingly dull and comes across as a missed opportunity. Speaking of which, Killers featured actors Danny Trejo and Jurgen Prochnow, so expect no product placement for Clearasil. All we needed were parts for Robert Davi and Edward James Olmos and Killers would enter the Bad Complexion Hall of Fame. The Replacement Killers appears in an aspect ratio of approximately 2.35:1 on this single-sided, dual-layered DVD; the image has been enhanced for 16X9 televisions. Chalk up this one as another fine offering from Columbia-Tristar (CTS), as Killers provided a consistently solid visual experience. Sharpness looked terrific from start to finish. At all times I found the picture to appear nicely crisp and detailed, with virtually no signs of softness or blurriness. It stayed detailed and distinct throughout the film. Jagged edges and moiré effects showed no concerns, and I also detected no concerns related to edge enhancement. In regard to print flaws, I saw some grain at the start of the movie, and I also noticed a speckle or two and a smidgen of grit, but overall, it seemed clean and fresh. Within the very stylized palette favored by former music video director Antoine Fuqua, the colors of Killers looked strong. The varying hues came across as vivid and clear, with vibrant tones that consistently appeared accurate and lively. Black levels also seemed deep and rich, while shadow detail was appropriately heavy but never excessively dense. Overall, the minor flaws kept The Replacement Killers from reaching reference level, but it still offered a very positive piece of work. Also good was the Dolby Digital 5.1 soundtrack of The Replacement Killers, though it wasn’t quite up to the standards of the visuals. My concerns related to the soundfield. On the positive side, this was a very active affair that kept all five channels working through the majority of the movie. Music showed good stereo imaging and the track provided a nice sense of general ambience. Where I felt less than satisfied dealt with the localization and integration of the audio. Too much of the audio blended together to an excessive degree. Much of the time, I thought sound seemed murkily defined and didn’t come across as distinctly located. Gunfire was the main issue, as the bullets seemed to bleed together and not come from terribly specific places. This wasn’t a major issue, and it’s not like placement of sound was incorrect; the material emanated from the appropriate areas. It just wasn’t as specific and distinct as it should have been. Audio quality appeared excellent. Speech was always natural and warm, and I noticed no problems related to intelligibility or edginess. Music sounded bright and dynamic, with clear highs and rich lows. Effects seemed clean and accurate. They showed no signs of distortion and also displayed solid bass response that was appropriately defined but not overly boomy. Ultimately, I thought the mix lacked strong enough definition to warrant a rating in “A” territory, but it still worked well for the most part. 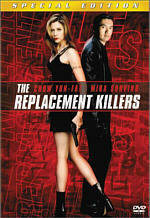 This new release of The Replacement Killers replaces an old movie-only edition and includes a decent little roster of supplements. We start with an audio commentary from director Antoine Fuqua. He provides a running, vaguely screen-specific track that has some flaws but generally offers a compelling experience. On the positive side, Fuqua covers a lot of good information about the film. He relates how he became involved in the project and seems nicely honest and up-front when it comes to negative issues on the set. While he doesn’t dish any serious dirt, Fuqua offers solid details about problems such as some changes forced upon him by the studio. He also gives us an interesting look at his thoughts on Asian cinema and a variety of film-related issues that didn’t deal specifically with Killers. My only real complaint about Fuqua’s commentary relates to its gaps. This track doesn’t suffer from a slew of empty spaces, but it offers more than a few and they’re largely unnecessary. That’s because it quickly becomes clear that Fuqua chats with an unheard interviewer. Most of his statements come from questions we never hear, and that gets frustrating. Not only does it contribute to the higher number of gaps, but also it makes some of Fuqua’s comments nonsensical. For example, at one point he makes a comment about some excised footage, but the interviewer described the content itself; Fuqua offers no information about the material other than to quickly relate why it was cut. As such, we know the reason behind the removal but still have no idea what was omitted! Many audio commentaries come from interview sessions like this, and only a few of them bother to let us hear the interviewer. I don’t know why that is; perhaps the issue revolves around money or rights. All I know is that it means the commentaries often seem less comprehendible. Most don’t suffer as much as Fuqua’s, which really loses something without the questions, but I still don’t understand why we don’t just hear the full audio. I still liked Fuqua’s track and thought it offered some good material, however, even with the awkward format. By the way, when I called the commentary “vaguely screen-specific”, I meant it. At times, Fuqua discusses material that occurs in the film, but that happens very rarely. Most of the chat seems more general, though. I liked it, but folks who dislike non-screen-specific tracks need this warning, as it might drive them nuts. After that we encounter some additional video features. First up is an HBO “Making-Of” special called Where the Action Is. This 10-minute and five-second featurette offers the standard mix of movie clips, shots from the set, and interview sound bites. In the latter regard, we hear from executive producer Matt Baer, director Fuqua, and actors Chow Yun-Fat and Mira Sorvino. If you expect much more than the standard promotional fare, you’ll depart disappointed. The program shows lots of material from the movie and touts it, though the hype factor seems somewhat subdued; it’s not as strident as many similar pieces. It includes a smidgen of useful data, but for the most part it seems pretty bland. Next we discover a 20-minute and 25-second documentary entitled Chow Yun-Fat Goes Hollywood. Though created relatively recently - especially compared with the four-year-old “Making-Of” special - “Hollywood” feels like an extension of the HBO piece. The format seems very similar, and the level of depth remains consistent. In this piece, we do hear from a few more folks, though. We get more from 1998 interviews with Chow and Sorvino as well as newer snippets from Fuqua, Baer, executive producer Terence Chang, director James Foley (who helmed Chow’s second American flick, 1999’s The Corruptor), Ed Baker of LA’s Cinefile Video, and Erik Nakamura, editor of Giant Robot magazine. Despite the additional length and higher number of participants, “Hollywood” appears just as superficial as the HBO program. I thought it would offer a nice look at Chow’s adjustment to American movies, but instead it’s little more than a puff piece. We learn a) how talented Chow is, and b) how nice Chow is. I don’t doubt that he’s both nice and talented, but I didn’t need 20 minutes of this show to tell me so. Frankly, Fuqua covers similar territory in his commentary and does so with greater detail; this documentary seems eminently avoidable. Somewhat superior are the Deleted Scenes we find here. Actually, the title is somewhat deceptive, as only one of the five clips was totally absent from the final film; the other four offer extended renditions of existing scenes. The snippets last between 33 seconds and three minutes, 43 seconds for a total of eight minutes and 12 seconds of footage. None of them are essential, and a few display very minor additions. However, I did like the sole truly deleted scene; entitled “John’s Father”, it provided some useful depth. Found in a separate section of the DVD, we also get an Alternate Ending. Don’t expect anything mind-blowing, however; this clip is really just an extended version of the existing conclusion. The piece runs for two minutes and 13 seconds and doesn’t really add much to the package. Note that all of the unused material appears in non-anamorphic 2.35:1 with Dolby Surround 2.0 audio. The quality’s pretty rough, though not terrible. Lastly, some of the old standards finish off the DVD. We get Filmographies for Fuqua, Chow and Sorvino as well as a selection of trailers. That area includes ads for The Replacement Killers (presented anamorphic 2.35:1, Dolby Digital 5.1), Crouching Tiger, Hidden Dragon (fullscreen, Dolby Surround 2.0), and The One (anamorphic 1.85:1, Dolby Digital 5.1). While I applaud the efforts of CTS to replace their older movie-only titles with special editions, as seen here, many of the new DVDs really don’t add much substantial content. On the surface, The Replacement Killers appears to provide a lot of new features, but only a few of these seem worthwhile. I liked the audio commentary from Antoine Fuqua, and I thought that at least one of the deleted scenes was solid. However, the others were somewhat flat, and both of the featurettes seemed superficial and generally uninformative. As a movie, I found The Replacement Killers to provide a flashy but fairly dull piece of work. The glitzy visuals never added up to much real excitement, and the film’s good cast couldn’t compensate for these concerns. The DVD offered very solid picture and positive sound plus the decent but lackluster collection of extras discussed above. So I find it difficult to recommend The Replacement Killers to many folks. Anyone who knows they love the flick but never bought the original DVD should grab it, I suppose; I see no reason to pursue the older one instead. Those less sure that they’ll care for the movie may want to rent it first - in either DVD incarnation - to see what they think. As for those who already own the prior edition, I think that one should be good enough for anyone who isn’t totally enraptured by Killers; some of the new additions are nice, but as a whole, they’re too insubstantial to warrant a repurchase.